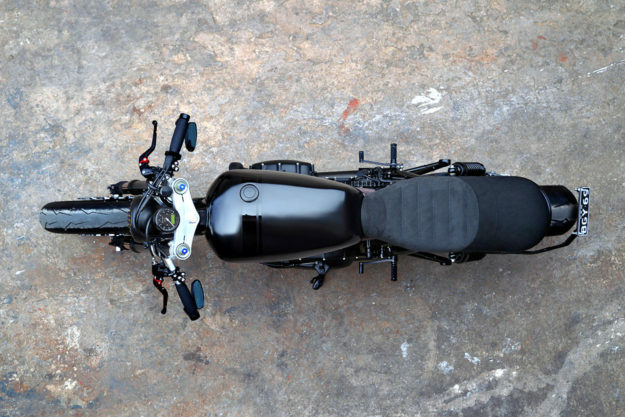 It’s a familiar story: a treasured bike, a crash, and then a rebuild. 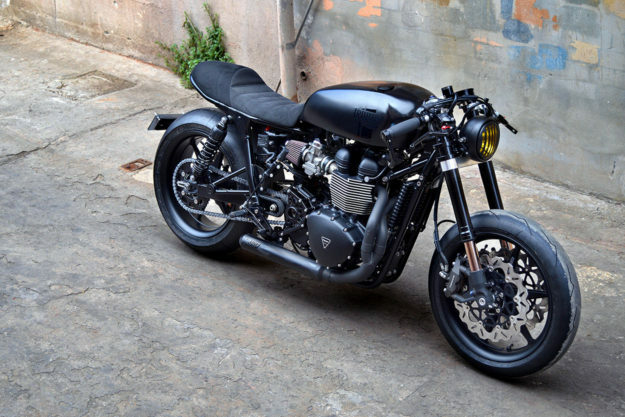 Except this isn’t a streetfighter: it’s a low-slung Triumph Bonneville with a serious set of upgrades. 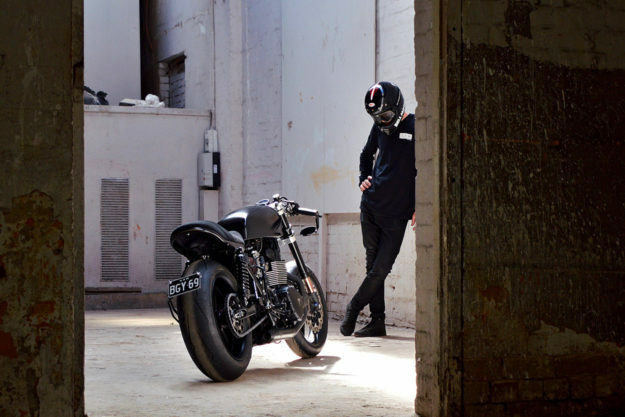 ‘Blak’ is the work of Gasoline, a Sydney shop that doesn’t (yet) have the worldwide fame of its neighbor Deus, but is fast building a reputation. The bike belongs to a Gasoline client called ‘Mixy,’ who was fortunately less damaged than his bike after the crash. The Triumph was riddled with other issues too. Mixy had made some mild modifications himself, but after meeting Jason and the Gasoline team, he decided to leave it to the experts. Plans for the rebuild expanded, and ‘Blak’ began to take shape. 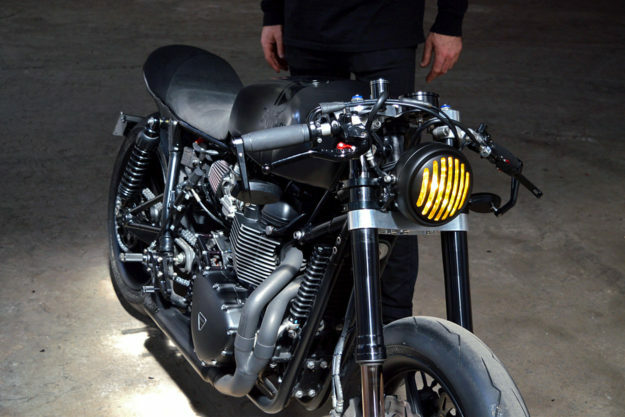 The front end was binned, and USD forks from a Suzuki GSX-R grafted on. A custom axle and spacers ensure that wheel specs remain the same, and the sportbike forks are held in place by a CNC’d triple clamp. 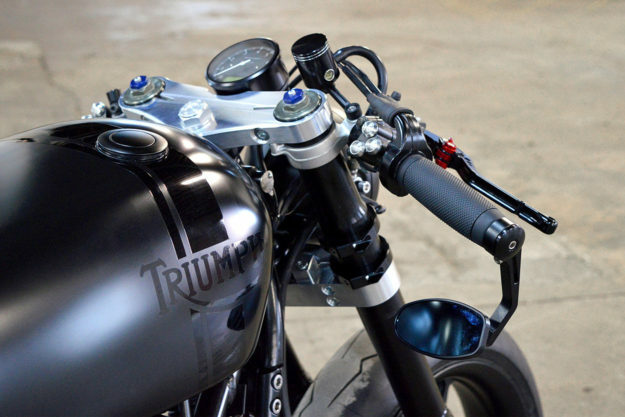 Adding to the racing vibe is a shift from mid to rear sets, and new low-profile clip-on bars for that vital café racer rider tuck. The wheels are US-made Canyon TTs—forged billet wheels CNC’d from 6061 T6 aluminum, with a revised cush drive and sprocket system that allows you to run wide rear tires with the correct alignment. 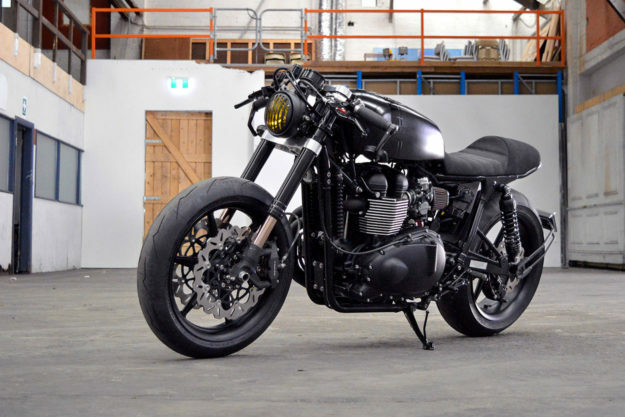 They’re a tribute to the Bonneville SE’s billet cut style, and designed to work with Galfer wave disc brakes. 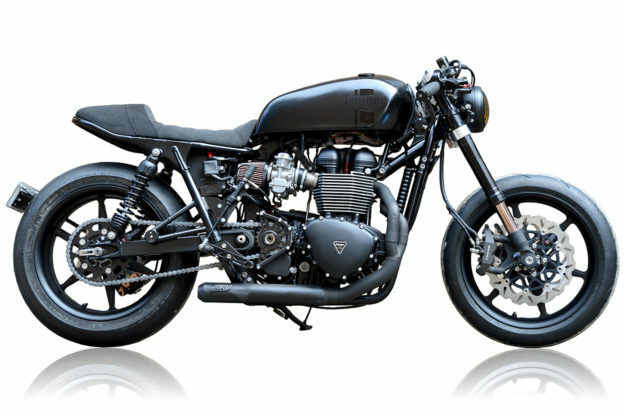 On this Bonneville the rims are shod with Pirelli Diablo Supercorsa tires, for a sporty vibe and maximum grip. The rear is a hefty 190 and really amps up the appearance of the bike. 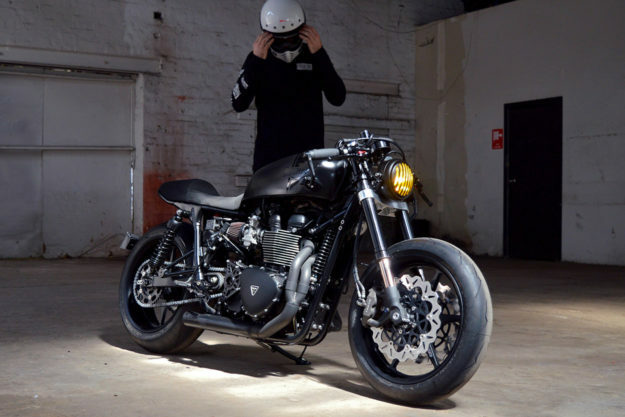 The only real splash of color on the Bonneville is the headlight, with a yellow lens concealed behind a black grill. “Like the flames from a raging furnace,” says Jason, tongue in cheek. ‘Blak’ is hot stuff all right. The new liquid-cooled Bonnies are getting all the column inches at the moment—but the older machines can look just as good, if you know what you’re doing. 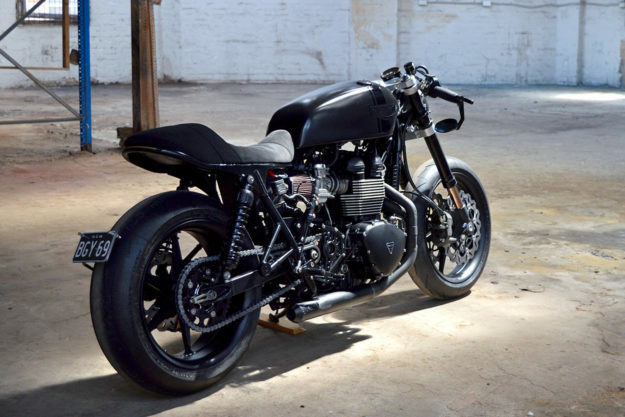 Judging by this build, Gasoline are masters of the dark arts.